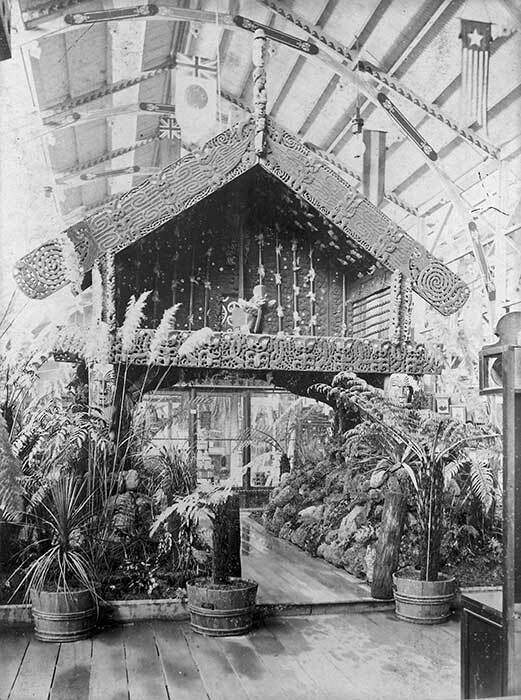 This pātaka (carved storehouse) was displayed amid toetoe (large grasses) and ferns at the 1888 Melbourne Centennial Exhibition. It had originally been carved in the 1850s for Ngāti Pikiao and stood at the Lake Rotoiti settlement of Taheke. Naturalist Walter Buller took possession of the pātaka and sent it to the 1886 Colonial and Indian Exhibition in London. It was then transported to Melbourne before finding a home for some years at Buller's estate on Lake Papaitonga, near Levin. In the 2000s the pātaka was on display at the Museum of New Zealand Te Papa Tongarewa in Wellington.